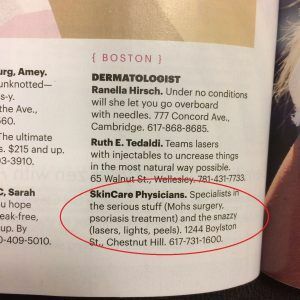 Skincare Physicians is proud to be mentioned in the newest Allure magazine as one three go-to dermatologists in Boston. In its Skin Guide 2018, Allure refers to our physicians as the “Specialists in the serious stuff (Mohs surgery, psoriasis treatment) and the snazzy (lasers, lights, peels)“. Kudos to our team!